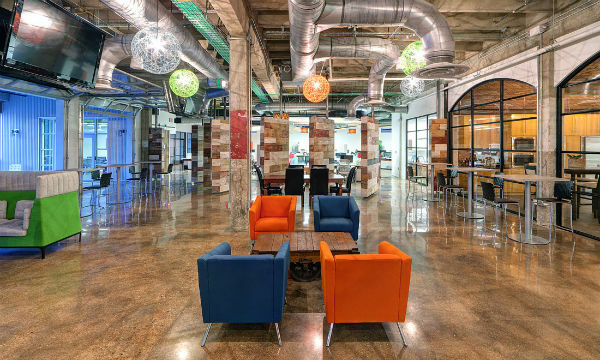 How can companies furnish their office to accommodate today’s more flexible and fluid work environment? Today’s workforce is fluid and mobile. People are no longer always glued to their desks. In an era where people can bring their laptops anywhere and access information on mobile devices, there’s more option to move freely and remotely. In some cases, companies have gone as far as eliminating assigned seating to the reduce physical workspace cost. This practice referred to as hot desking, where employees may not always use the same desk each day. On top of this, the demand for more collaboration and quiet spaces has led to the popularity of hybrid offices. These offices incorporate a variety of features, combining the best of both worlds: the common space of open offices and the enclosed rooms found in traditional workspaces. With increased prices in real-estate, businesses are further challenged to save space while creating functional work environments that facilitate productivity. What are some ways to address these concerns with office interior? Below are seven furniture solutions to consider. 1. Furniture pieces with power outlets. As employers are moving between meeting rooms, quiet spaces, and desks, furniture pieces with power outlets are no longer luxuries — they are necessities in today’s digital age. Nowadays, a variety of furniture pieces come with power outlets, such as tables and even sofas and chairs. These designs enable mobility, as more people can change locations without worrying about their dying battery. When it comes to hot desking, one way to streamline this process is to place workers into colored groups so they know which workstations to use. That way, the office can still have an organized set-up without assigned seating. This avoids the inconvenience of mixing HR with developers and marketers with accountants, or having to move resources around. One of the challenges of hot desking offices is that staff don’t have their own desk to store their belongings. In these kinds of work environment, it’s essential to have a place staff can put their stuff. Lockers provide a great solution to this problem. As well, they are ideal for eliminating clutter and preventing theft. 4. Monitor arms and height-adjustable desks. Although offices are becoming more fluid, many of us still spend most of our time by our desks—and risk becoming hunchbacks. To reduce damage to our spine, monitor arms and height-adjustable tables are available to help improve posture by keeping the monitor at eye-level. These lounge seats enable people to create an endless array of configurations. It’s perfect for the hybrid office space where rooms serve multipurposes. With these seats, you can create a group setting for casual discussions and meetings, or align them in rows for a company presentation. As well, these chairs can also easily be placed along walls for extra space. To encourage collaboration and productivity, companies have organized their office according to different departments and teams. To facilitate this, office desks now come in a variety of configurations, where desks can be easily arranged into various groups. This makes for easy partnership for projects and tasks, while still ensuring the furniture is still functional. Semi-private hubs or booths gives people a private space to work or recharge at a different location. Some companies, such as LinkedIn, have even gone as far as creating a “silent disco room” where people can take a short break and dance to music with headphones on. 8. Finding inspiration at the office. With so many office interior solutions, companies are not only finding creative ways to save cost and streamline workflow, but are also designing spaces where people can find comfort and inspiration. Perhaps your next product or advertising idea will come from sitting in a beanbag or talking to colleagues at an open office bar.